Teaching your Dog to "Pick it Up" or "Take It"
Trick or Treating can be lots of fun for the humans in the house, but taking your dog out is probably not a good idea. Just because we don’t advise taking your dog out for trick or treating, doesn’t mean that he/she can’t be part of the fun! How you ask? Teach your old dog a new trick! 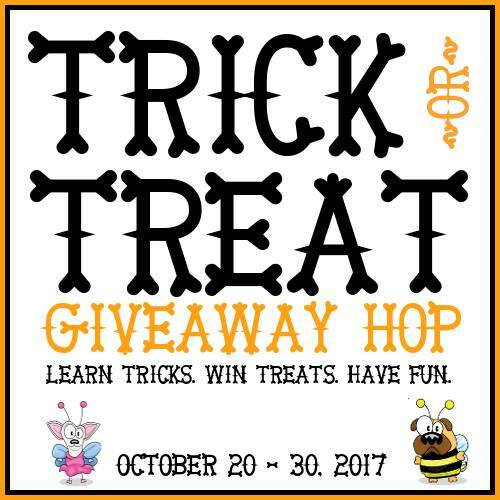 It’s time again for the annual Halloween Trick or Treat Giveaway Hop! 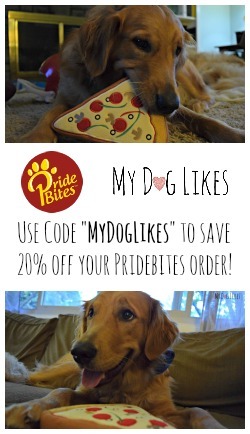 We, along with 19 other bloggers are teaming up to use positive reinforcement (and lots of yummy treats) to show you some great tricks you can teach your dog! We can’t call it a giveaway hop without some awesome prizes and sponsors, and this year there are over $850 in prizes up for grabs. Learn more details at the bottom of this page, but first, let’s get to the trick! If you know Harley and Charlie at all, you know that they are friendly guys who LOVE Halloween. No, it’s not because we dress them up in great costumes…it’s because of all of the children who come to our door looking for candy. They just love visitors! Every year we put a baby gate up in the doorway and allow them to answer the door when the kids come knocking! They love it and so do the kids! This year we decided that we would elevate the greeting a little and really get the boys involved by helping them carry the candy container to the door! In order to accomplish this, we are teaching the dogs to “Take It” and “Hold it”. All teaching starts with a little bit of positive reinforcement. We are strong proponents of using a clicker for teaching a new trick because it helps to reinforce the exact moment that your dog does one of the approximations of the behavior that you are looking for. If your dog has never used a clicker before, or if they haven’t used it in a while, start by “charging” the clicker. Charging a clicker isn’t complicated, simply click then treat your dog. The click will start to get their attention. 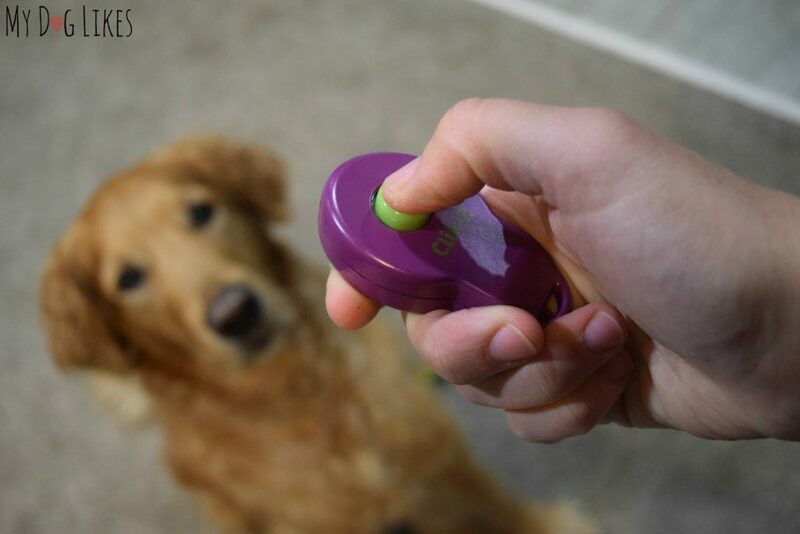 You will know that the clicker is “charged” when the sound of the click stops them in their tracks as they wait for a treat! The next step can be done in one of two ways. You can choose to have your dog pick up the object from the floor, or take it from your hand. Clear the room of any other toys or loose objects that might be distracting or confusing. Place the toy between you and your dog. Your dog will look to you and try to figure out what you want them to do so that he can get a treat. When Charlie started learning, he tried all of his tricks like sit, lay, paw, place, etc. in an effort to figure out what I wanted. This is the hard part, but wait! Your dog will explore his environment and learn! As soon as your dog touches the toy with his mouth, click and reward. 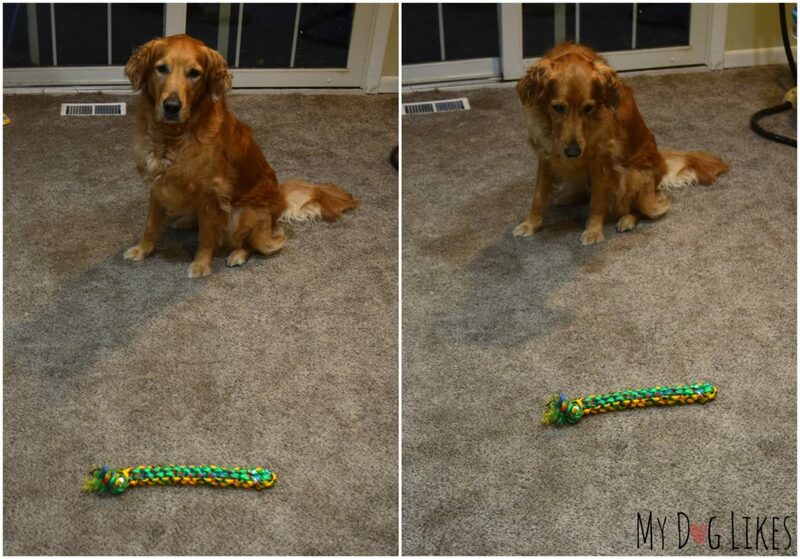 If your dog needs a little help with this step, pick up the toy for a moment, point it out, or move it in some way to bring their attention to it. Once again, AS SOON as they touch it with their mouth/pick it up, click and reward! Keep doing this until your dog is consistently touching the toy with his mouth. Because your goal is to have your dog “take” the object, start to only click and reward when they pick it up. This is how you will shape the behavior! To have your dog take something from your hand, the steps are similar. While holding an object in one hand, click and reward when your dog touches the toy with his mouth or puts it in his mouth! 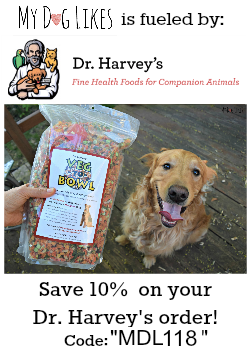 This can be a little harder because there is not as much separation between you, your dog, and the treats that you have, so he may be distracted by your treats! 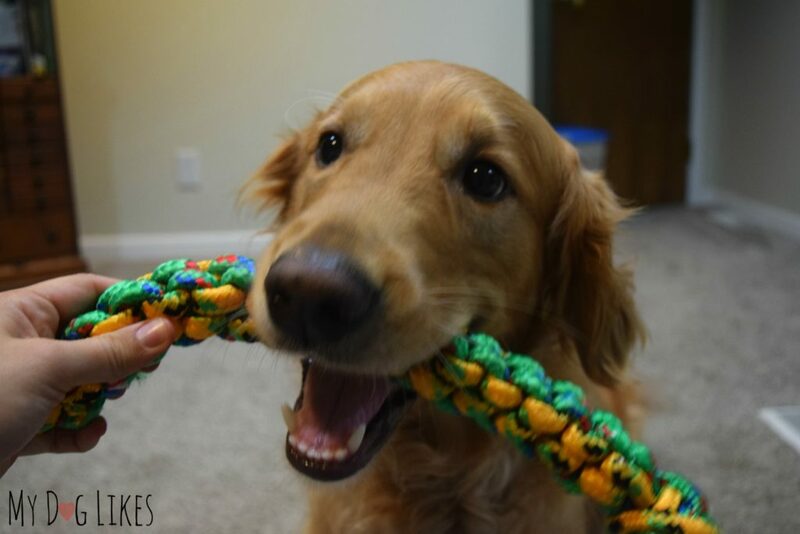 HINT: Use a toy or familiar object that your dog likes to play with already! 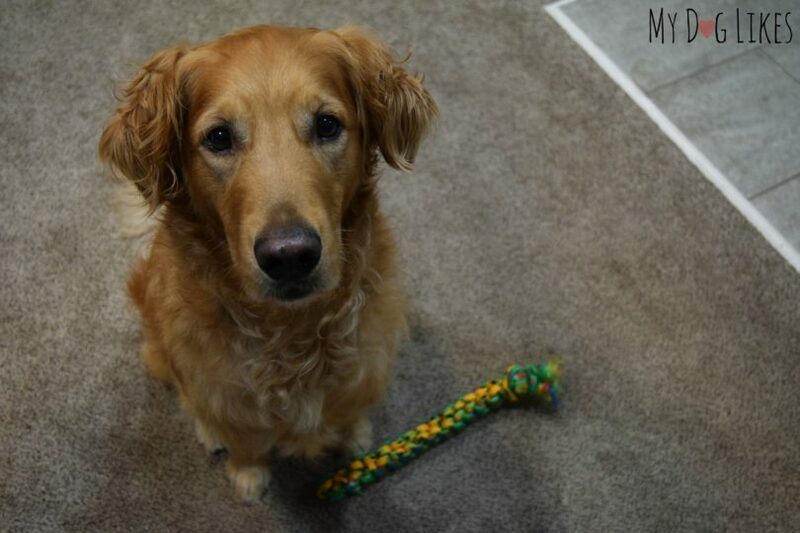 Once your dog is consistently putting the object in his mouth and getting that you want him to work with the toy, pair it with a command such as “Take It” or “Pick It Up”. 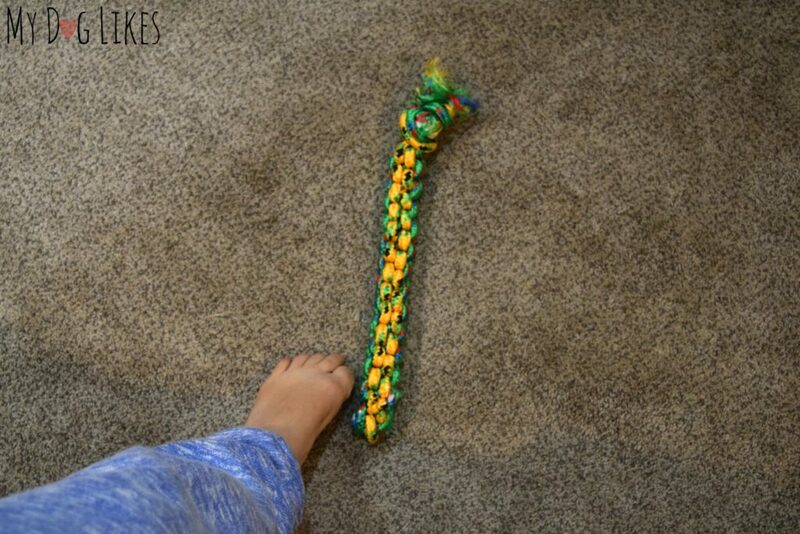 Keep on clicking and treating until the command gets your dog to pick up the toy! After your dog gets the verbal command, try to switch out the object that you are using. Be sure to take the toy that you had been using away so that it is not confusing. 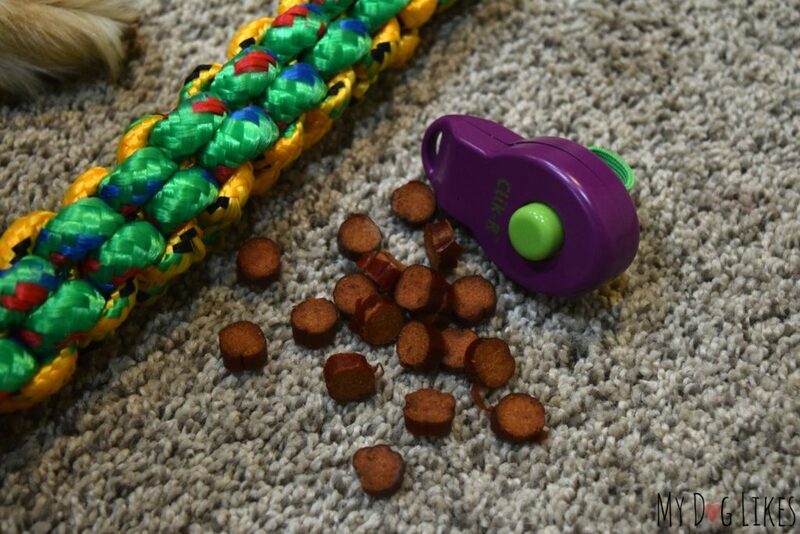 This will help your dog to learn that your command applies to lots of different things, not just the toy that you used at first! Be sure to keep on clicking and treating! 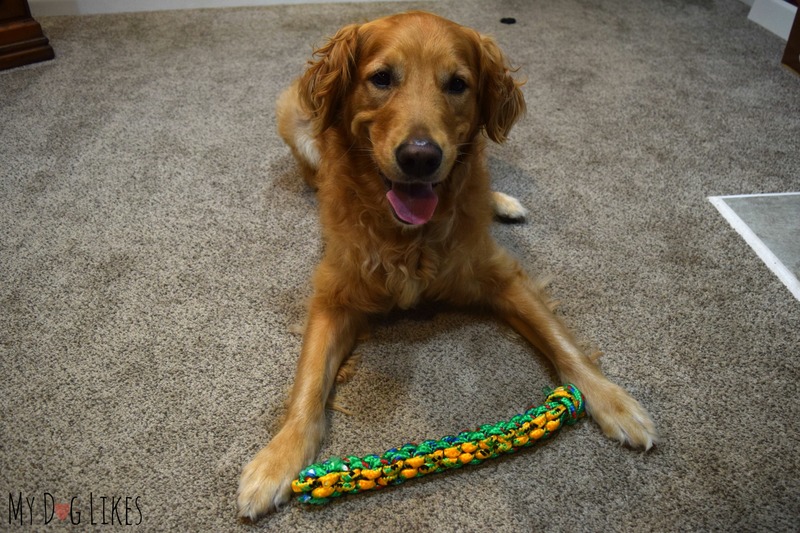 After lots of practice over several training sessions, you can shape the behavior so that your dog will hold the object in his mouth for a longer period of time. Simply place the item on the floor/hand it to your dog and only click and reward when he holds it in his mouth for a predetermined amount of time. Start small-like 2 seconds, then reward. Gradually, you can build up longer periods of time. When they start to get what you want them to do, you can introduce a command such as “hold it” to show them that you want them to keep the item in their mouth! How Can I Use This Trick? There are a lot of uses for this trick. This trick is a great foundation for more complex tricks like getting them to clean up their toys. Its also great if you love to photograph your dog with something in his mouth, pick up the newspaper etc. How Did We Use This Trick? Halloween of course! We generalized this trick to a pumpkin bucket that we use for candy for our trick or treaters. We first practiced it by having them pick up the empty bucket, then by adding some weight so they would get used to it being a bit heavier. On Halloween they will be ready to go live with this trick and greet our trick-or-treaters at the door! If you want to try something similar, awesome! 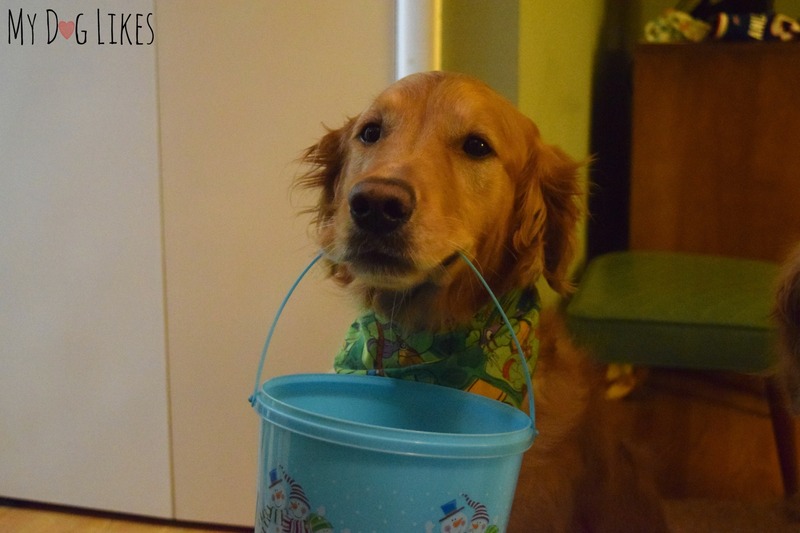 Just be sure to hand your dog the bucket of candy and then take it away from them so they don’t eat any of it! Wondering what is up for grabs? Make sure to visit all of our blogging friends listed below for more chances to win! 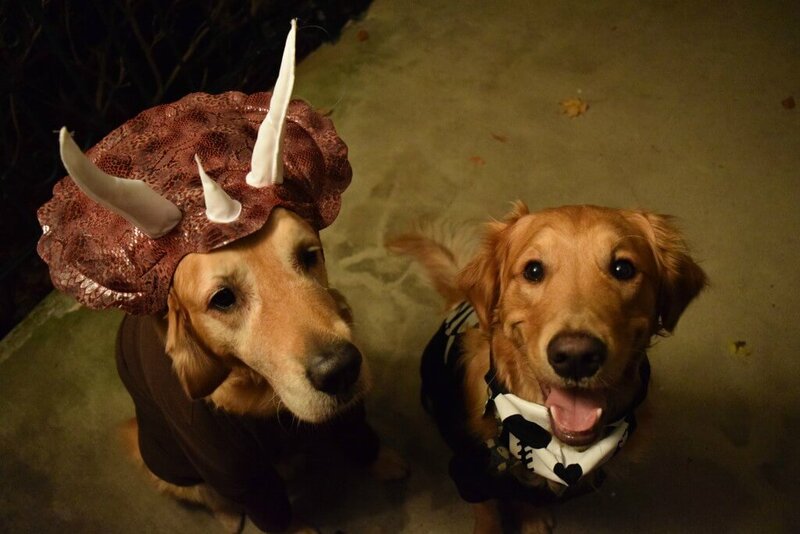 And don’t forget to follow #TrickorTreatDogs social media for even more fun! Our dog doesn’t know this trick. Yes , my girl knows this trick. I taught it the same way. no we don’t know this trick! Love this trick! Take it is so useful and really fun too. Very well written also! Thanks for sharing. My dog knows this trick when she wants to. I absolutely love your dogs. They are so handsome and I love how they love Halloween and the kids. Whatever did we do to deserve dogs. My dogs do not know this, but it’d be cute to teach them! Delilah will sometimes greet me at the door with a toy in her mouth. It’s the cutest thing ever! I can’t imagine how the little ones will react to see the dogs passing out candy! Great trick. Wonderful post and I love your costumes! That one is even more important to master! Something our Charlie has always struggled with! My dogs don’t know this trick. I do have a clicker (somewhere). I’ll have to try to teach them. I’m not sure if it’s just me, but I can only access the first couple of entries on the form. I’ve tried looking at page source and found the Gleam link, but that only gets me about 4-5 of the entry methods – the page won’t let me scroll down. Do you have a direct link to the form? Or, can you check on how you have it embedded into the page? I would like to do all the entries. Hi, Linda! I just reinserted the widget – can you try again and let me know if it works for you? Nice trick. We are not big on holding things. Mom has tried, but with limited success. 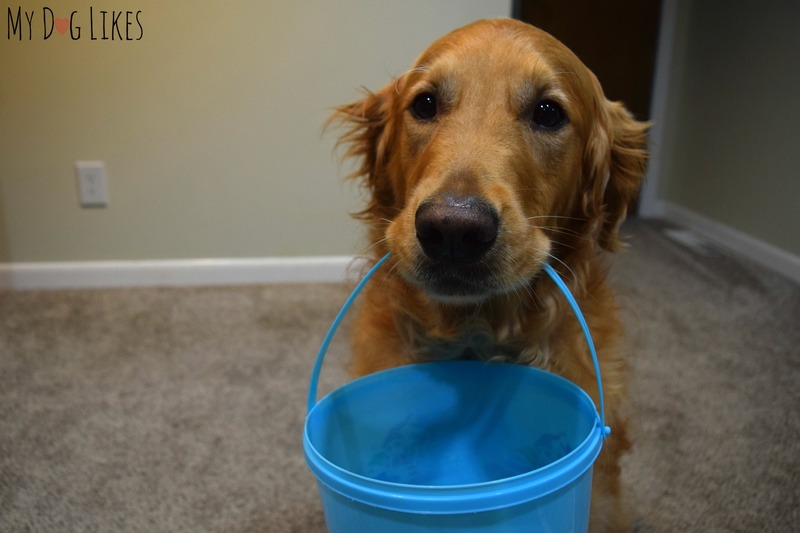 I guess we will just stop by your place on Halloween to see an adorable dog holding a bucket! This is a fun one that we haven’t tried but would be great for photos of certain items. Time to get practicing! Thanks for sharing! I can’t wait to see photos or videos of the dogs in action on Halloween! No, my dogs don’t know this trick. It would be nice to teach them though. My dog does know this trick. I think it is because she has a stuffed frog she has had since we first brought her home. She loves that frog so much and knew what I was asking her for when I would tell her to go get froggy. From there she learned how to bring other objects to me. My dog doesn’t know this trick. He will pick up things on his own and not give them back (like toys). Cooper knows a variation of this. He likes to take an inside toy out in the backyard with him, but I don’t want him to leave it out there. So if he starts to come back inside without it I’ll tell him “bring (toy name) in”. I think I”ll try this method to enhance this behavior. Great trick and one my dog doesn’t know. How neat for kids to take candy from a dog holding the pail of candy! Yes, my dogs know this. We taught it by marking and rewarding the behavior every time they offer it. Melvin doesn’t know this trick. He does know leave it and get it. But doesn’t know how to hold! Cooper knows this one. We took him to a training class and worked on these commands. Going to try from the pick up off the floor on with my youngest. She can take from the hand but generally wont pick up. Yes, but she taught herself! My dog knows this trick! I taught her somewhat similar to this and she caught on fairly quick. My dog learned some of these things in his training class and others we taught by use of treats. I am a dog walker and pet sitter and don’t teach my furry friends tricks but I know the prizes available will make great treats for my furry friends so I hope to be included in these draws. A couple of my dogs know this one the puppy is still learning. no, my girls do not know most of this trick, however, the youngest will pick up her toys. Yes she knows this trick very well we used the same methods! My dog doesn’t know this one! No Milo doesn’t know this; or rather he knew and he forgot I think. Maybe we should start over with the clicker. He knows how to do this-just not always when I want-we should work on this one! Your dog is adorable. No, we haven’t tried using a clicker for training or many tricks as of yet. Thanks for the idea. Thanks, Pat! Let us know if you give it a try and how it goes! My dog will take it on command but only from my hand….not from the floor. Part of the problem is her mouth is so tiny. And she physically could not pick up the candy bucket like Charlie & Harley. She is height challenged. my dog doesn’t know this trick but i am going to try to teach her. she loves to learn. My dog knows commands from repetitive practice using a bumper. My dog did know this trick yes! Nope, my dog doesn’t know this trick. I am just happy if he pees outside. Our dog does not know it. But I like the instructions on teaching them. WIll try it out! my dog does not know this trick. He is very limited in tricks. Hey thanks for putting together all of this info in one place. Happy Halloween! My beagle knows this trick although we use different command words. My Dog doesn’t know this trick but I will try teaching her with the clicker. I taught several of my dogs using this method but without the clicker. No….I have yorkies & they do not know this trick. My dogs don’t know this trick but I might try it soon. This would be a new trick for my dog. I guess I better get training! The only trick my dog knows is getting us to give him everything he wants. My dog knows no tricks she was a rescue and had been abused so she was scared of everything and now she is just old like me. No, our little dog does not know this trick. neither of my dogs know that trick. I’m still working on rolling over. Our boy Bailey does not know this trick but I know he would enjoy doing it. My dog does know this trick. She learned it in training class. Great idea! I have 400 to 500 trick/treaters every year, so this will be one that we will be learning to do this week. So cute! I think my dog could learn this if I tried it. I would start with some easy things first though. Mine has learned a lot of tricks recently and we are working on him retrieving items right now. You have given me a wonderful idea! I’ll be teaching him this trick tomorrow with treats and praise. Thank you!! My dog doesn’t know this trick but it would be great for her to learn. No Sheba does not know this trick. I will teach her now that I know how you correctly do this one. Mine doesn’t know this one yet. He is a bit stubborn. I’m working on basic commands right now. maggie does what she wants to do. No but its awesome! Will have to try this with my little guy!! No my dog never learned this trick. I want to teach this to my dog now! Fantastic blog! My dog doesnt do this trick but he knows a number of others. I tried the clicker on him- he detested it and would not respond. The sound of it bothered him. He learned just with praise. Grady knows this one, when I taught it I had to use praise or play as his reward though because even kibble was too high value to get him to continue to interact with the non food items. My pup doesn’t know this yet. Will be checking this out! Thanks! No, I don’t think so. Love Skamp tricks or not he’s our treat and a great family dog. Our girls will have a ball learning this! Thank you! No, our dogs cannot do that one! Wow! I have to try to teach them it. so neat! We have never used the clicker! How much fun!! We are going to start working on this trick right away so we can hand out treats with him on Halloween! Great article. No my 7 month German shepherd does not know this trick however, i think i could teach it to him. He is very hyper and has no limit on what he will get into. My dogs do not know this trick and I have never used a clicker. I have had a very difficult time trying to train 4 dogs at the same time. If one learns a trick as soon as they realize the other 3 don’t do do it than they quit doing it. My dog doesn’t know this trick, but he’s the best emotional support dog ever! No he doesn’t know this trick! I’ll have to teach him it looks like a good trick to know! She doesn’t know yet,but she will now ? I have never used a clicker. My dogs do not know that trick but will try without using a clicker, Sounds like a fun trick. Both of my dogs got this trick quickly! Ae have a clicker and haven’t tried it yet in the method shown. It most like is something we will try as our Lucy is very responsive to clicker training which we use. My dog does not know this trick but I want to teach her it now! My dog does what she wants. All I do is love her! She is sweet and well behaved. My dog does what she wants. All I do is love her! She is sweet and well behaved. This is not a duplicate comment! My dog doesn’t know this trick. She’s deaf, so clicker training doesn’t work. She knows hand signals for a few commands — ‘sit’ and so forth — but we’ve never really gotten into teaching her tricks. My dogs do not know this trick, but this looks like a fun one! No my dog does not know this trick. My dog doesn’t know this trick. She’s a rescue and a little stubborn so we’ve been patiently working with her. My dog Belle knows this trick. Would love to teach her new tricks. My dog does not know this trick, but I think I need to use this method to teach him! My dogs no “leave it” in much the same way. Neither of our dogs can do this. It seems like a lot of work, very cool though. Yes! My Boston terrier can do the fetch and hold, he started it himself! He would bring me baby toys and stand looking at me to chase him over it, so I decided to give him treats instead and now he cleans the floor toy by toy and will pick up items like the Halloween pumpkin bucket on command. He needs a nice extended hold like your Golden though. I didn’t use a clicker, I just captured his behavior with a YES. Thanks, Paula! We think so too! My 1 yr old lab, Trooper is still learning. He does not know these two, and I am going to try them. I will try this… as soon as I can find my clicker. My dog does not know this trick but I have not tried it yet. No my dogs do not know this trick. Thanks for the lesson! we dont know this one yet, but it sounds like i can teach him! my dog doesn’t know take it, but he does know leave it. I’m looking forward to teaching him this one. No, our dogs do not know this trick. We teach our dog a few tricks. We do like to teach tricks. I love how you did this for Halloween – what fun! We used this to get Luke to carry a basket too, and also to get him to pick up his toys. We’ve had a lot of fun with it! My dogs don’t know any tricks. No, my dog does not know this trick but you’ve inspired me to teach her! My dog doesn’t know this trick but I think I will buy a clicker and try to teach her. My dog does not know this trick. We taught her some basic ones and that was it. I’ve found it to be difficult to teach some things with two young dogs but my second pug knew every toy by name and he knew to look where I pointed, not at my finger. I haven’t taught this trick to my dogs, they are pretty small so a bucket would probably not be possible but maybe a really small stuffed toy would work. Nala and Cody don’t this trick but what fun you are gonna have when trick or treaters come to your door. I mean whoncan resist Harley and Charlie’s adorable faces. Our dog hasn’t been taught this trick but I’m going to start teaching him. This is a great post with easy to follow steps. I’m excited to get started! Yes, all my dogs know this trick. We used the same method to teach. I would be able to teach one, Eva, but, most likely not Mitzi. I would try on both though. We’re working on it! Pup is doing great so should have it nailed soon. Thanks for the post.